Washington (CNN) - On the same day that Jay Carney stepped up to the podium for his first official briefing as the successor to Robert Gibbs as White House press secretary, the man who lost out to Carney for the coveted post officially announced he's bolting the administration on Friday. 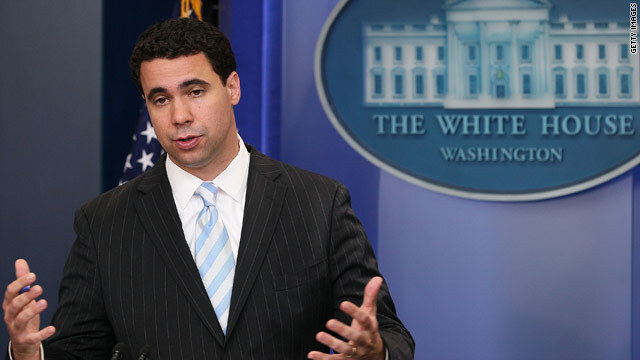 Bill Burton, who was the principal deputy press secretary to Gibbs, revealed in an e-mail that he is leaving President Obama's staff at the end of the week to start a new political and strategic consulting firm with Sean Sweeney, an ex-adviser to two former White House chiefs of staff, Rahm Emanuel and Pete Rouse. "I will never forget the hardworking and decent people I worked with here - and I am so thankful for the opportunity to have been a part of it," Burton wrote in the e-mail to colleagues and members of the White House press corps. Burton, whose wife Laura is expecting the couple's first child this spring, said he had an epiphany this weekend as he prepared their Washington home for the new baby's arrival. "And while I have felt a real fulfillment in this position - from the walls of this building to the shores of Honolulu - painting the new baby's room this past weekend gave me clarity about a house I might want to spend a little more time in," wrote Burton, who won high marks from colleagues when he filled in for Gibbs at several White House briefings and served as chief spokesman during Obama's past two vacations to Hawaii over the holidays. "So on to the next chapter in my professional career." Friends of Burton were deeply disappointed that he did not get the President's nod to replace Gibbs after paying his dues and being groomed as the likely successor as press secretary. Burton moved to Chicago during the 2008 campaign and was a critical part of the rapid response team, and worked long hours as Gibbs' top deputy for the past two years without ever slipping up when he filled in as the top spokesman. But when the White House went through a broader staff shakeup after the "shellacking" of the November election, Burton perhaps became a victim of his baby-faced looks, with senior Democratic officials privately saying that Obama and new Chief of Staff Bill Daley were looking for someone with more of an experienced look at the podium heading into the 2012 re-election battle. In the end, Obama tapped for the post the slightly older Carney, a former journalist who has more experience in media but far less time in the Obama political orbit. After leaving TIME magazine after the 2008 election, Carney had spent the past two years serving as communications director for Vice President Joe Biden. Burton has not publicly expressed any bitterness about the process, though he did allude to his long service for Obama in his farewell e-mail, which also included a joking reference to "hangers-on" who signed on much later. "Four years ago this week, I stood with many of you in Springfield as then-Senator Barack Obama announced an improbable campaign for President on an unbelievably cold day," Burton wrote. "And then I stood with a lot more of you on an unseasonably warm night in Chicago as the next First Family strode onto stage in Grant Park. There was another cold day in Washington - when all the rest of you hangers-on showed up - and that Senator became President. And all those days since, we worked together to make the change he promised a reality in the lives of countless Americans." It's worth noting that while Carney signed up to the Obama world around the time of the 2009 Inaugural, Burton's new partner Sweeney also joined up at that point as well. Burton and Sweeney worked together at the Democratic Congressional Campaign Committee when it was run by then Rep. Emanuel, and Sweeney continued to work for Emanuel on Capitol Hill when Burton went to Chicago for the 2008 campaign. Sweeney also previously worked as a political adviser for the campaigns of Sen. Chuck Schumer, D-New York, as well as current Secretary of State Hillary Clinton when she was in the Senate. "And now we enter into an exciting new phase of our lives," wrote Burton. Good luck and congrats on the baby. So a few people in the White House come and go as usual. Who cares? Good riddance....Burton is the south end of a north-bound horse.